String Mazes are perennial favorites, but have you considered creating one for Christmas morning? I want to avoid the Christmas present vortex — it’s like a black hole where I spend months of my life preparing, shopping, wrapping and making a perfect Christmas morning. Then in a flurry of wrapping paper and squeals, Christmas is over in 10 minutes. Okay, maybe not 10 minutes, but pretty darn close. Some families have different strategies for making Christmas morning more meaningful and last a little longer, like requesting family members take turns to open gifts. At our house, we do a game every Christmas — with the first step being a string maze! I first saw this idea on Pinterest. I asked a colleague of mine about it and she decided to write a post on MyKidsAdventures about string mazes. The minute I read that article, I knew I wanted to incorporate it for our next Christmas. We’ve been doing a Christmas morning string maze since our boys were ages 5, 6 & 9 years old. We’ve learned a lot over the years on how to use string mazes and make a super fun activity on Christmas morning. Below, I’ve listed out the steps to do this at your house, including examples from our own home. Why Do An Active Game on Christmas Morning? Change the Focus: Doing a game on Christmas morning helps lower the commercial aspect of the holidays. Instead, the focus is re-directed to spending time together as a family. And my kids are like many others who enjoy hands-on, kinesthetic activities where they move around and have a goal (with a surprise at the end). It’s engaging and fills the holiday morning with a spark of wonder. Budget Stretcher – Yarn is not terribly expensive and can be used year after year. A string maze will make Christmas feel like more of an event, for just a little extra time and money. Yarn : We use a different color for each child. We don’t use a full skein of yarn. About half a skein for the youngest two. Our oldest is super, super fast with the yarn so his is about 50% longer than his siblings. Strategy for the end of the string : The first year you might want to have the string lead straight to a gift. Immediate reward. My kids have several layers to their Christmas morning game, so it leads to a clue (more about this below). Learn how to wrap-up yarn: Unless you want to have a huge string mess to clean up, have your kids properly wind up the string as they go. It’s easy. My kids’ were so excited to do the maze, they didn’t mind following the elves’ instructions on wrapping up the string. They needed help the first year, but it’s totally possible. You can see detailed instructions in this article on MyKidsAdventures (under #6: have a ball). We’ve re-used the same balls of string for several years. Prepping Children — The first year we let the kids know elves might be doing something fun in the morning and they should keep their eye out. A little bit of warning goes a long way. 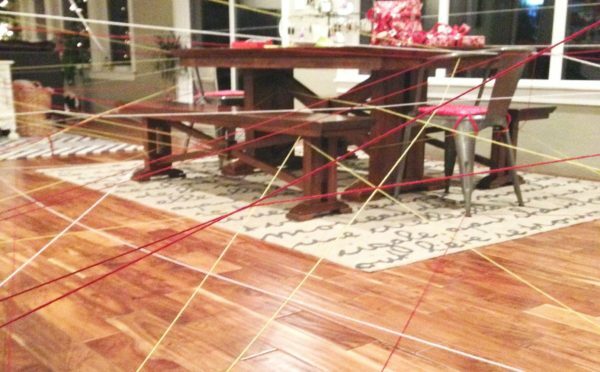 Prepping Spouses — A string maze is possible with one parent, but it’s much faster and more entertaining with two grown-ups! My husband is always hesitant to start this project (he’d rather go to sleep because he’s an early riser), but after a few minutes of stringing the yarn, he’s the one going the extra mile to make it amazing. Pull out an end of your yarn and start pulling it around the house. Wrap around chairs, couches, table legs — anything that won’t fall and/or break with a little tugging. Our house has an open floor plan, so it’s easy to go between several rooms of the house. But, it can be even more fun to follow string through halls and doorways, even through different floors of the house (you’ll need more string for that, but how fun would that be?!). Working as a team: Like I said above, if you’re working with a partner, this is faster. When you are getting started, hook the string around one end of the room, then toss the yarn ball to your partner at the other side of the room. Have them hook the string on an object and throw the skein back. You can get a good “base” started. The maze gets too complex to do this at the end. Watch what you’re wearing: You’re going to need to channel your inner Catherine Zeta Jones. Avoid getting yourself tripped up on any strings by not wearing a hoodie or clothing that will hook on the string you’re setting up. Toward the end of this maze project, maneuvering is tricky. Avoid Tight Spots: Only string through large openings, especially at the end of your string maze. Remember, while your ball of string is getting smaller, when you’re child reverses the string’s path, their yarn ball will be getting larger. Even after several years of doing this Christmas morning activity, even we sometimes forget. Last year we pulled a string through a sliding door handle. The ball of string wouldn’t fit through so we had to cut and then knot it. Use all the space: It’s easy to make the string hoover around your knees. But, it’s more visually interesting to have the string at different levels. For our oldest, his string is placed especially high, like on curtain rods or tucked around upper cabinets. Do the string maze LAST: Once you do the string maze, it’s incredibly difficult to move around the room. That means the elves need to stuff the stockings, set out any other gifts, and eat any treats left out for Santa and the reindeer before you get started on this string maze. Before you finish, think about where you want to end your string. Select a spot that your kids won’t be exploring while they’re rolling up their yarn. So the end of your yarn might end inside a cabinet drawer. Don’t have the string wrapped around that same drawer because they might open the drawer to more easily wrap up their string. Plus, it would be pretty obvious if their string ends in that drawer. We have so many string lines going that it’s difficult to visually track where the string ends. We’ll often end the string in a closet or cabinet (that we didn’t use before) or under a rug. Put your thinking cap on to see where the best, discrete place to end the string maze might be. At the end of your string maze, you can place a gift. Done! Or, if your gift won’t fit in that last spot, you can write up a note for the child to look under their bed or in another location where the gift fits. You can also add a second step to the string maze. This works well if your kids have done similar activities in the past, or if they’re a little older. At the end of our boys’ string maze, each of them will find a clue. However, they’ll need all the clues to move forward, so they must patiently wait for (or help) their brothers to finish their string. Then they combine their clues to figure out the next step. You know, cooperation and all that good stuff. Last year, I had a puzzle for them to put together, then flip it over. As parents, we let the morning pace itself, so the kids ended up finishing their string maze, then they took a break and ate breakfast, then they attacked the puzzle. Each Christmas Eve, it takes us about an hour to do three string mazes (not full skeins) through three rooms of our house (plus the entry way). It takes our kids about 45 minutes to take it down. The first year, we had to help the kids a lot. Now my husband makes a huge Christmas breakfast while the boys are busy with the yarn maze. By the time they’re done with the yarn maze and then eat breakfast, it’s over an hour of holiday fun. At our house, the gift at the end of the string is their only present from Santa, other than the stockings. Some years it’s a $10 gift and other years is a more expensive gift for the whole family. This changes the focus of Santa from “lots of presents” to more of a fun game that the elves put together for them. So we’ve done several little activities after the string maze, like the puzzle above. This year, my kids are going to find sheets of white printer paper with mysterious areas of the paper cut out of them. They’ll have to place them on certain pages of Christmas books and the holes in the pages will reveal specific words to solve a riddle. I don’t know exactly how I’m going to do it, but I’m excited to try out this new add-on portion of our Christmas morning games. What little clues, games or surprises would you have at the end? Give us more ideas to build on fun, family traditions on Christmas morning! Such a cute idea! My kids would absolutely love this! Your adorable kids would totally be into this. You have to send me a photo if you do it – I’ll be expecting a text from you around midnight, Christmas eve. hahaha! How did you have them collect puzzle pieces along the way? We’re they attached somehow to the yarn? Hi Vanessa – You could totally have them collect the puzzle pieces along the way! Very cool idea. And I think they could still figure out the clue if they were missing one or two pieces. But, this is how we did it: Right after the kids went to bed, we dumped the puzzle pieces out on the kitchen table. At the end of the string maze was a piece of paper (I’d typed up the clue and then cut it into three strips so all three boys had to put their papers together to see the full clue). The clue told them to put the puzzle together *on* the cardboard on the kitchen table (there’s another piece of cardboard needed to put on the top so they can flip the puzzle over… does that make sense?). So then they put the puzzle together. As they put the puzzle together, they noticed the sharpie partial-letters on the back. And they also figured out that they needed to flip it over. Then they realized what the second piece of cardboard was for — to place on the finished puzzle and flip it over. If they get stuck, I’ll give them hints so they don’t get too frustrated. I want them to have fun! Let me know if you have any other questions!! Hi Alexa – I’m glad you like it! Tell Brian that Kris groans about it, but in the end, he’s the one stringing the yarn from the rafters. He has fun doing it…once he gets started ;). Brilliant! This makes me wish my girls were little again! Hi Reese – Thanks for the shout-out! A couple days ago, I spoke with my friend, Jen, who originally taught me how to do a string maze. She said she actually first did it in college! I had no idea!! How funny is that?! Anyway, she swears it’s fun for all ages :). Just saw this done tonight in “The Nutcracker and the Four Realms”. I was so intrigued that I dashed to the internet to see if this was a real thing, as I definitely want to do this activity with my teenagers. So thrilled to have found your blog! Thank you for generously sharing this with us! I totally agree, Sarah! I saw Nutcracker and the Four Realms last week and I about jumped out of my chair, whispering to my friend, “That’s a string maze! I do that, I DO THAT!” I’m so, so glad you were thinking the same thing when you ran across my article. Love it! !